The Royal Palm Turkey is a very small turkey popular as an ornamental bird. They are rarely used for meat, although this is a use for them on small farms. They are also valuable because of their ability to rid an environment of any annoying insects. Because of their small size, Royal Palm Turkeys are rarely the birds seen on American’s Thanksgiving tables. What they lack in meat value they make up in ornamental capacity. 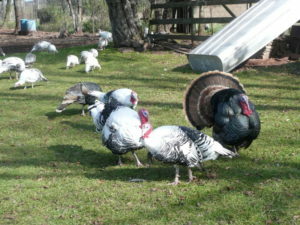 Unfortunately, because Royal Palm Turkeys have never been highly bred for meat they are rare today. Many people are beginning to realize this bird’s value as a meat bird for small families. 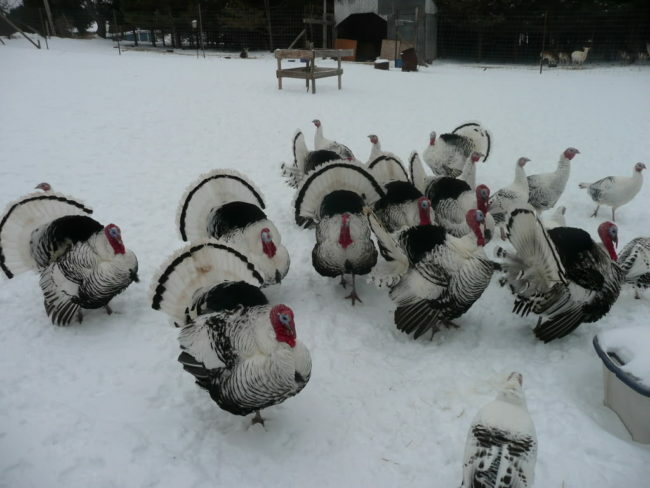 They are also easy to care for in a smaller environment than the larger turkeys require. Royal Palm turkeys are known for being somewhat nervous animals. They are efficient animals to keep as they are good foragers and can generally take care of themselves. 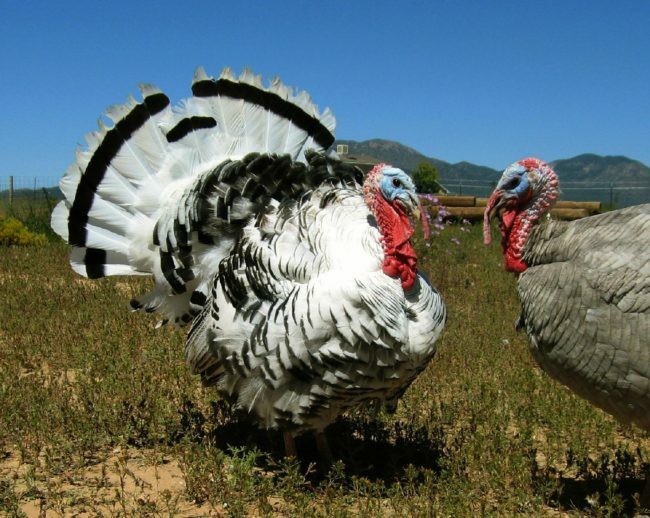 A small bird, male Royal Palm Turkeys (or “toms”) rarely exceed 22 pounds in weight. The females, or “hens”, are significantly smaller and usually weigh around 12 pounds. 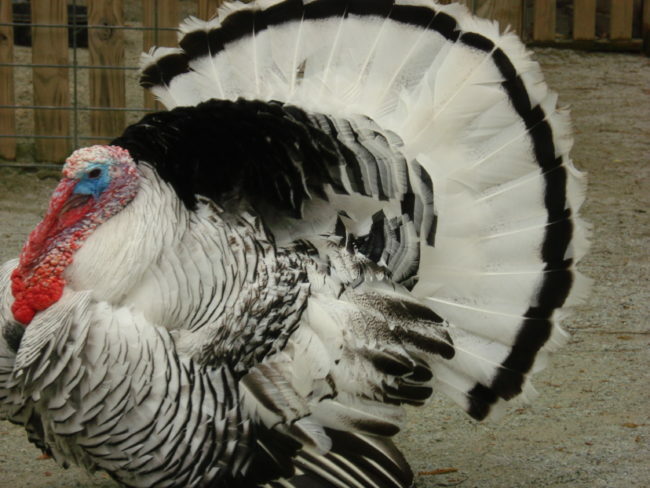 Most Royal Palm turkeys are primarily white, with black appearing only on the edges of the feathers. Their saddle also dramatically contrasts the white base color with its shiny, black coloration. Royal Palms have white necks that are banded in black and the tail is white with a metallic black band. The Royal Palm’s head is usually reddish or bluish white. Other varieties are also possible, although these have never been well established. 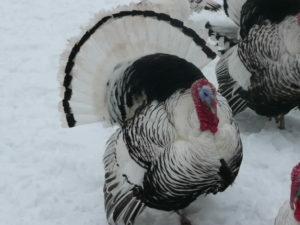 The Royal Palm Turkey was first accepted into the American Poultry Association in 1971. Unfortunately, the small size of this clever, thrifty bird makes it undesirable as a meat bird and so it is rare throughout the world.